Some Tour Dates, Some Reviews. February 26, 2014 9:08 am | Filed under: Music | Comments Off on Some Tour Dates, Some Reviews. As is my long-standing tradition, I'm writing an overdue post here to let everyone know I'm still ok. 😉 Actually, I have quite a bit of news; some tour-dates, some reviews and a rare solo performance! First of all, the end of 2013 was especially exciting in that my latest album Distilled was on Jakob Baekgaard's All About Jazz list of the Top albums of the year, and the blog JazzWrap chose it as Album of the Year! Very flattering. Then this month I was thrilled see a very thoughtful, glowing review on the French website Citizen Jazz. It was also given the special "elected" status there. Ooh la la! I'm also thrilled to announce a European tour with my trio next month beginning in Copenhagen on March 13th and ending in Vienna on March 22nd. The complete schedule is here. Unfortunately this also means we'll be on the road when the Icelandic Music Awards happens. We'll make sure to have someone ready to accept on our behalf if we are that lucky. At least we have 4 chances. 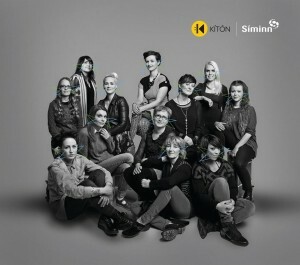 Lastly, I will be performing solo at Harpa on March 2nd as part of the KÍTÓN (Women in Music) festival. Although I've played at Harpa before with my trio, this will be my first time in the 1800 seat Eldborg – gulp. I'll also be performing with some of the other women on the festival like Ellen Kristjáns and Hafdís Huld. Get tickets here. Comments Off on Some Tour Dates, Some Reviews.